On Sunday, the United States and the United Nations used the strongest language yet in condemning the strike on a U.N.-run shelter in Gaza, with Washington calling the attack "disgraceful." "The United States is appalled by today's disgraceful shelling outside an UNRWA school in Rafah sheltering some 3,000 displaced persons, in which at least ten more Palestinian civilians were tragically killed ... We once again stress that Israel must do more to meet its own standards and avoid civilian casualties. The suspicion that militants are operating nearby does not justify strikes that put at risk the lives of so many innocent civilians." The school was being used as a shelter for about 3,000 people. 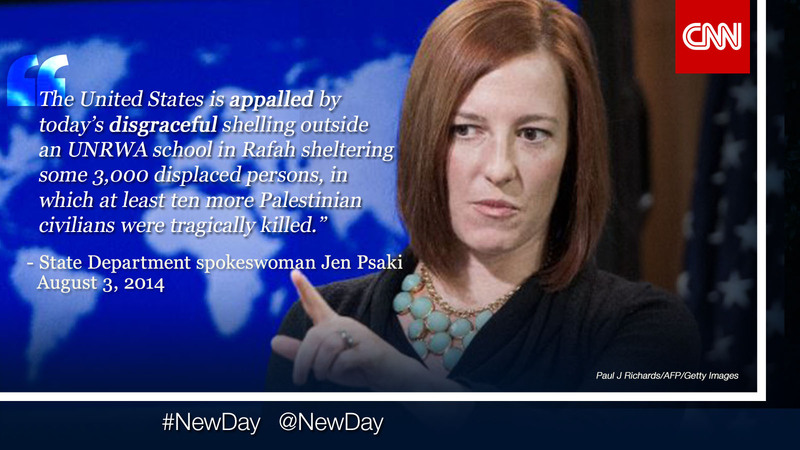 On "New Day" Monday, Chris Cuomo asked Psaki if the condemnation means anything if the State Department won't take action to stop the practices of Israel. CUOMO: When you use the harsh words, they seem kind of empty because the U.S. supports Israel, almost unconditionally, you know why they’re doing this – you know they’re going to keep doing it, so why even come out with a statement like that that kind of injures Israel, but you’re not really going to do anything to stop the practice? PSAKI: Well, Chris, with all due respect, I think you are oversimplifying the issue here. The issue here is that Israel, we believe they have the right to defend themselves, and we understand that they can't, the people of Israel can't be waking up every day with terrorists coming in through tunnels threatening their lives and threatening the health of their people. But at the same time as they're defending themselves, there's more that can be done to prevent attacks that are impacting civilians in Gaza. This is something that we see in war zones around the world. This is not an ask or a standard that is uncommon, that a country like the United States or a country like Israel should hold itself to. Do you think the State Department is doing enough to limit civilian deaths and help end fighting between Israel and Hamas? San Bernardino County was the site of dangerous flash flooding on Sunday that left one person dead. The heavy rain and steep terrain resulted in mudslides that blocked roads and trapped residents. The threat of rain is diminishing for the region. Indra Petersons explores how the canyon can enhance dangerous flooding.